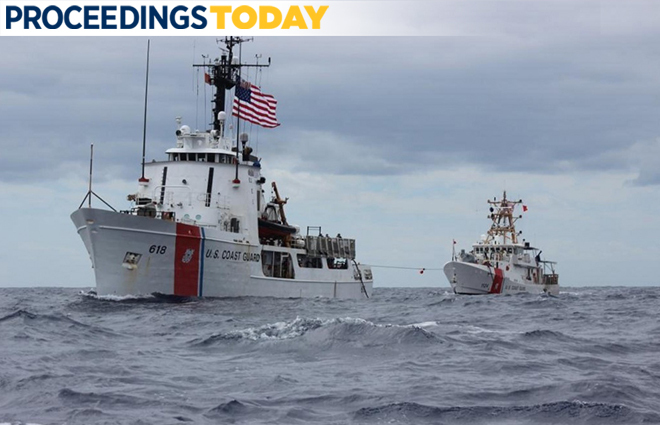 The USCGC Active (WMEC-618) was commissioned in 1966 and is still serving–a tribute to the Coast Guard’s “can do” culture. By admitting that Semper Paratus is an aspiration, the Coast Guard can allow itself to celebrate the truth that while the service is not Always Ready , Coast Guardsmen embrace every task to meet their mission. That might not be the service’s aspiration, but it should be its inspiration. Aspirational, Inspirational, or a curse? I have to question if that is even legal, It subverts the legislative process. Thanks, It is probably not illegal if the money stays within the same department, but certainly not a choice I would have made. Got a link to confirm that? As I was thinking about this this morning I realized I did not have confirmation of where in the process this happened. If this was actually done to the FY2019 budget in the appropriations committee then I see no legal question. If it was done to the already approved FY2018 budget, then we have a problem. My understanding is money can be moved between executive departments (i.e. State to Defense) via a budget process called “transfers.” Movement within an executive department is called “reprogramming”. Either congressional (appropriations) notification, explicit approval or statuatory authority is required dependent on the amount and/or the process. There is also the requirement that for either process the transferred funds are to be used for the same reasons as obligated by the original Congressional intent. The Coast Guard does not construct buildings to house illegal immigrants as far as I know..
why take money from an agency that stops immigrants? we have been, for quite awhile, the sea wall. Just a reminder we don’t discuss politics here. We discuss what happened but don’t speculate about blame. The amount deducted from the FY2018 budget was relatively small. I hope there was a reason for the amount selected. The real question is what will happen with the FY2019 budget. Apparently the Appropriations committee intended to cut the CG budget by $1.4B including the Heavy Polar Icebreaker. Even if funded in FY2019 we probably will not see it until 2024. Thanks for the reminder Chuck. Do you think jumping all the way to 6 Icebreakers turned some people off, and they are pulling back from the whole thing now? Actually, I think we are getting a lot of support for the three heavy and three medium program, but at any rate even stronger support for heavy #1.